1. Heat a splash of water in a saucepan over a medium heat, then add the spinach and wilt for 2 minutes. Spoon onto a plate lined with kitchen paper; use more paper to squeeze out any excess water. Tip into a bowl, add the crème fraîche and season. 2. Toast the bread, then rub with the cut sides of the garlic; spoon the spinach on top. Flake the fish in the same bowl, discarding the skin. Stir in the horseradish, lemon juice and a little black pepper. 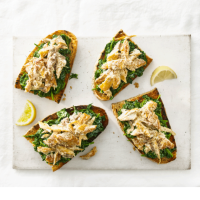 Pile onto the toasts and serve with the lemon wedges.